Helen Holcombe was born on 8 December 1851 at East Granby, Hartford Co., CT. She was the daughter of Oliver Robbins Holcombe and Mary Ann Sill. Mary Sill Holcombe was born on 31 January 1854 at East Granby, Hartford Co., CT. She was the daughter of Oliver Robbins Holcombe and Mary Ann Sill. Mary Sill Holcombe died on 27 October 1859 at age 5. Jessie Fremont Holcombe was born on 6 July 1856 at East Granby, Hartford Co., CT. She was the daughter of Oliver Robbins Holcombe and Mary Ann Sill. Jessie Fremont Holcombe died on 1 December 1888 at age 32. Effie Holcombe was born on 22 April 1860 at East Granby, Hartford Co., CT. She was the daughter of Oliver Robbins Holcombe and Mary Ann Sill. Effie Holcombe died in 1891. [S25] Hannah McPherson, Holcombe Genealogy, Page 216.1/Item A-8-4-9-1-4-1-2-4. Robbins Sill Holcombe was born on 6 September 1862 at East Granby, Hartford Co., CT. He was the son of Oliver Robbins Holcombe and Mary Ann Sill. Robbins Sill Holcombe died on 11 April 1879 at age 16. Annie Eliza Holcombe was born on 19 October 1864 at East Granby, Hartford Co., CT. She was the daughter of Oliver Robbins Holcombe and Mary Ann Sill. Truman and Electa were enumerated in the 1850 Granby, Hartford Co., CT census with James, age 20, a shoemaker. Truman and Electa were enumerated in the 1860 Granby, Hartford Co., CT, census, with Charles and Mary in the household, living next door to son Lewis. It is not known where Mary, age 11, fits in. Electa would have been 48 or 49 at her birth, unlikely her mother. [S161] Carol A. Laun, Granby Center Cemetery, Page 111/Item V-49. [S414] Hon. Horace L. Moore, Andrew Moore, Page 173. [S414] Hon. Horace L. Moore, Andrew Moore, Page 97. [S414] Hon. Horace L. Moore, Andrew Moore, Page 98. [S414] Hon. Horace L. Moore, Andrew Moore, Page 246. Florence submitted for membership in the DAR and was assigned number 15478; but here seems to be a discrepancy on her gr-gr-grandmother, Susannah Holcomb, as there were apparently two Susannah's. DAR application for Mrs. Florence Smith Spencer, #15478, shows descent from Hezekiah and wife Chole Pinney. However, Chloe was Hezekiah's daughter-in-law, wife of Hezekiah II. Mrs. Spencer next shows Luther Holcombe and wife Susanna Holcombe. Susanna was Capt. Hezekiah's second child, but McPherson shows she married only Samuel Forward. There is a Luther Holcombe, son of Asahel that married an untraced Susanna. In researching Mrs. Spencer's records, Carol Laun cites the Simsbury Vital Records, pages 68, 217, 227; East Granby Vital Records, pages 95, 98, 129; East Granby Church Records, pages 34, 47, 123; the Alderman Genealogy; the Episcopal Church Records, page 57; and "The Report, oct 1968, OH Genealogical Society" - all viewable at the Salmon Brook Historical Society in Granby of which she is Curator. [S414] Hon. Horace L. Moore, Andrew Moore, Page 271. Dr. Phelps Humphrey was born on 7 December 1800 at Hartland, Hartford Co., CT. He was the son of Dr. Philander Humphrey and Anna Selby. Dr. Phelps Humphrey married Maria Holcombe, daughter of Luther Holcombe and Suzannah Holcombe, on 2 January 1834 at Turkey Hills, Hartford Co., CT.2 Dr. Phelps Humphrey died on 1 August 1860 at Belmore, Putnam Co., OH, at age 59. Phelps and Maria settled in Hartland, Ct. In 1838, they removed to Granville, Ohio, and subsequently to Columbus, Ohio, whence, his health becoming impaired, they removed to Etna, Licking Co., Ohio, in 1849. Failing to completely re-establish his health, he relinquished the practice of his profession, and settled on a tract of and owned by him in, or near, Belmore, Putnam County, Ohio. Dr. Phelps Humphrey studied medicine under his father, and graduated from the medical department of Yale College. He stood high in his profession, and was a man universally beloved. The Christian Religion claimed much of his consideration in his later years, and he died in its firm faith and consolations. He was a Justice of the Peace in Hartland, Ct; was appointed Probate Judge for the District of Granby, in 1835, and was a member of the Legislatures of Connecticut (from Hartland, 1835) and of Ohio. He had the Bible of Esquire Daniel Humphrey, containing records of the family. Maria resided (1882) Toledo, Ohio, with her daughter Mrs. Waring. [S205] Albert Carlos Bates, Records of the Congregational Church in Turkey Hills, now the Town of East Granby, Connecticut, 1776-1858, Page 136. [S275] Frederick Humphreys, Humphreys, Volume I, Page 217. Eleanor Thrall was born in 1776 at CT. She married Calvin Holcombe, son of Asahel Holcombe Esquire and Sarah Eno. [S205] Albert Carlos Bates, Records of the Congregational Church in Turkey Hills, now the Town of East Granby, Connecticut, 1776-1858, Pages 36, 46. Anson Myron Holcombe was the son of Calvin Holcombe and Eleanor Thrall. Anson Myron Holcombe was baptized on 2 May 1819 at Congregationalist, Turkey Hills, Hartford Co., CT.2 He married Eliza Root. Eliza was enumerated in the 1850 Westfield, Hampden Co., MA, federal census. She was 40. Children in teh household were Emily 21, and Morton A. 16. [S25] Hannah McPherson, Holcombe Genealogy, Page 216.1/Item A-8-4-9-1-5-2. [S205] Albert Carlos Bates, Records of the Congregational Church in Turkey Hills, now the Town of East Granby, Connecticut, 1776-1858, Page 98. 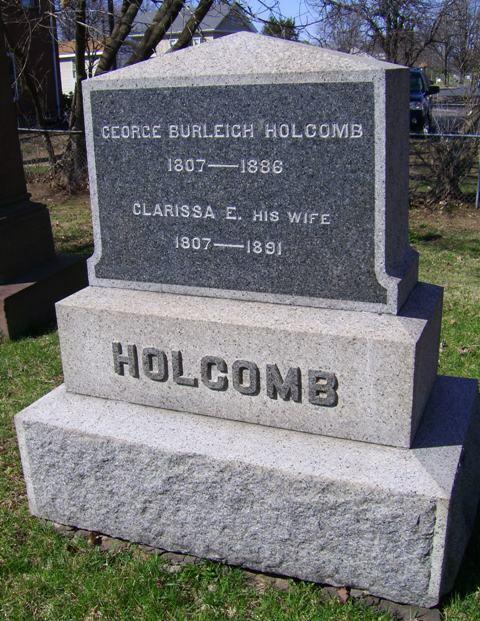 George Burleigh Holcombe was born on 15 July 1807. He was the son of Calvin Holcombe and Eleanor Thrall. George Burleigh Holcombe was baptized on 2 May 1819 at Congregationalist, Turkey Hills, Hartford Co., CT.2 He married Clarissa Eliza Holcombe, daughter of Cephas J. Holcombe and Hannah Holcombe, on 1 January 1829. George Burleigh Holcombe died in 1891. He was buried at East Granby Cemetery, East Granby, Hartford Co., CT.
George "P." and Clarissa were enumerated in the 1850 Granby, Hartford Co., CT, federal census. He was a farmer, age 43, she was also 43. Corinthia was 15. Other members of the household included "Ellen" Holcombe, age 74, and what appear to be other members of the Thrall family. George and Clarissa were enumerated in the 1860 East Granby, Hartford Co., CT, federal census. He was a farmer, age 52, she was 53. Eleanor Thrall age 81 was also in the household. George and Clarissa were enumerated in the 1870 East Granby, Hartford Co., CT federal census. He was a farmer age 62, she was 64. [S25] Hannah McPherson, Holcombe Genealogy, Page 216.1/Item A-8-4-9-1-5-3. Eliza Root married Anson Myron Holcombe, son of Calvin Holcombe and Eleanor Thrall. Emily Holcombe was born at MA. She was the daughter of Anson Myron Holcombe and Eliza Root. Morton Holcombe was born in 1833 at MA. He was the son of Anson Myron Holcombe and Eliza Root. Morton Holcombe died on 9 May 1907 at East Granby, Hartford Co., CT. Possibly the Morton enumerated in the 1880 East Granby, Hartford Co., CT, federal census. He was a laborer, age 46, born in MA. His wife was Orleann Clark, age 42, born in CT. They were in the household of Orleann's mother, Lydia Clark, age 81. This same Morton and Orelann were enumerated in the 1900 East Granby, Hartford Co., CT, federal census. He was 66, she was 62. They had no children. Morton M. Holcomb, aged 73 years, died at his home in East Granby Thursday after a short illness. The funeral will be held Saturday afternoon at 2:30 o'clock at his home and is private. Clarissa Eliza Holcombe was born on 22 August 1806. She was the daughter of Cephas J. Holcombe and Hannah Holcombe. Clarissa Eliza Holcombe married George Burleigh Holcombe, son of Calvin Holcombe and Eleanor Thrall, on 1 January 1829. Clarissa Eliza Holcombe died on 20 May 1891 at age 84. She was buried at East Granby Cemetery, East Granby, Hartford Co., CT.
[S25] Hannah McPherson, Holcombe Genealogy, Page 122.2/Item A-8-1-2-2-10-4. Corinthia Holcombe was born on 11 March 1835 at CT.2 She was the daughter of George Burleigh Holcombe and Clarissa Eliza Holcombe. Corinthia Holcombe married George Frederick Newberry on 22 November 1857. George and Corinthia were enumerated in the 1860 Windsor Locks, Hartford Co., CT, federal census. He was a carriage maker, age 27, she was 25. There were no children in the household. George and Corinthai were enumerated in the 1870 Windsor Locks, Hartford Co., CT, federal census. He was a carpenter, age 37, she was 35. The only child in the household was Lizzie 6. George and Corinthia E. were enumerated in the 1880 District 16, Hartford, Hartford Co., CT, federal census at 5 Pleasant Street. He was a pattern maker, age 47, she was 45. The only child in the household was Lizzie H. 16. Corinthia Holcombe was buried at East Granby Cemetery, East Granby, Hartford Co., CT.
[S25] Hannah McPherson, Holcombe Genealogy, Page 122.2/Item A-8-1-2-2-10-4-1. George Frederick Newberry married Corinthia Holcombe, daughter of George Burleigh Holcombe and Clarissa Eliza Holcombe, on 22 November 1857. Elizabeth Holcomb Newberry was born on 14 July 1864 at Bloomfield, Hartford Co., CT. She was the daughter of George Frederick Newberry and Corinthia Holcombe. Elizabeth Holcomb Newberry married Elijah L. Parsons in 1929. Elizabeth Holcomb Newberry was buried at East Granby Cemetery, East Granby, Hartford Co., CT.
Ruth Cost Duncan does not mention Eli's other marriage to Miriam. Eli Phelps married Ruth Case, daughter of Noah Case and Miriam Holcombe. Eli Phelps was born in 1743. He was the son of William Phelps and Mariah Holcombe. Eli Phelps married Miriam Case, daughter of Noah Case Jr. and Mary Adams. Eli Phelps died on 28 January 1829 at Poquenock, CT.
[S65] Deanna Holcomb Bowman Thomas Holcomb, Vol. I:Pg 146/Item 6683. [S101] Ruth Cost Duncan, John Case, Pages 21, 47. [S359] William Alderman Parker, Alderman, Page 536. [S359] William Alderman Parker, Alderman, Page 528. Ruth Phelps was born at Poquenock, CT. She was the daughter of Eli Phelps and Miriam Case. Miriam Case was born in 1776. She was the daughter of Noah Case Jr. and Mary Adams. Miriam Case married Richard Adams Jr. on 27 February 1793 at Barkhamsted, Litchfield Co., CT. Miriam Case married Eli Phelps, son of William Phelps and Mariah Holcombe. Miriam Case died on 4 May 1869 at Poquenock, CT.
Children of Miriam Case and Richard Adams Jr.
Eli Phelps II was born on 1 September 1807 at Poquenock, CT. He was the son of Eli Phelps and Miriam Case. Eli Phelps II married Abigail Humphrey, daughter of James Humphrey and Roxelana North, on 27 May 1846 at Winsted, Litchfield Co., CT. Eli Phelps II died on 1 September 1879 at Poquonock, Hartford Co., CT, at age 72. [S25] Hannah McPherson, Holcombe Genealogy, Page 95/Item A-6-6-8-3-2. [S65] Deanna Holcomb Bowman Thomas Holcomb, Vol. I:Pg 147/Item 66832. Mary Phelps was born in 1809 at Poquenock, CT. She was the daughter of Eli Phelps and Miriam Case. Miriam Phelps was born on 18 December 1812 at Poquenock, CT. She was the daughter of Eli Phelps and Miriam Case. Miriam Phelps married Elihu Holcombe, son of Moses Holcombe and Hannah Wells, on 20 March 1832. Miriam Phelps died on 6 October 1852 at age 39. Mindwell Phelps was born in 1814 at Poquenock, CT. She was the daughter of Eli Phelps and Miriam Case. Sarah Phelps was born on 9 April 1817 at Poquenock, CT. She was the daughter of Eli Phelps and Miriam Case. Abigail Humphrey was born on 7 March 1820 at Norfolk, Litchfield Co., CT.1 She was the daughter of James Humphrey and Roxelana North.1 Abigail Humphrey married Eli Phelps II, son of Eli Phelps and Miriam Case, on 27 May 1846 at Winsted, Litchfield Co., CT.
Cornelia Emeline Holcombe was born on 1 October 1834. She was the daughter of Elihu Holcombe and Miriam Phelps. [S25] Hannah McPherson, Holcombe Genealogy, Page 216.2/Item A-8-4-9-3-2-2-1. Sarah Albina Holcombe was born on 23 March 1838 at CT. She was the daughter of Elihu Holcombe and Miriam Phelps. Sarah Albina Holcombe died after 1910. Helen Augusta Holcombe was born on 12 February 1841. She was the daughter of Elihu Holcombe and Miriam Phelps. Helen Augusta Holcombe married William R. Best. Helen Augusta Holcombe died on 26 March 1919 at age 78. She was buried at Elm Grove Cemetery, Poquonock, Hartford Co., CT.
[S25] Hannah McPherson, Holcombe Genealogy, Page 216.2/Item A-4-9-3-2-2-3. Albert represented Windsor in the State Assembly, 1889-1890. He is recorded in the 1900 Windsor, Hartford Co., CT, federal census, film T623-139, sheet 323A, page 7A, supervisors district 26, enumeration district 229, line 5, with Martha, Alice, Herbert, sister Sarah and brother Wells. Son Louis is recorded next door. Albert and Martha were enumerated in the 1910 Windsor, Hartford Co., CT, federal census. He was 66, she was 62. The only child in the household was Alice M. 35. Also enumerated were borther Wells 59, and sister Sarah 72. Albert E. Holcomb, former state representative for Windsor and prominent resident, died this morning at his home on Poquonock Road. He was born October 25, 3843, the son of Elihu and Mariam Phelps Holcob. He had been a farmer and tobacco grower most of his life. He leaves three children, Louis E. Holcomb, Albert M. Holcomb and Miss Alice M. Holcomb, all of Poquonock, and three grandchildren, Mrs. Frederick Wilbraham, Mrs. L. F. Hallisey and Albert Holcomb, all of Hartford, and one brother, Wells Holcomb of Poquonock. The funeral will be held at his home tuesday at 2:30 p.m.
[S25] Hannah McPherson, Holcombe Genealogy, Page 216.2/Item A-8-4-9-3-2-2-4. [S284] Courant, 29 January 1928. Wells Henry Holcombe was born in June 1850 at CT. He was the son of Elihu Holcombe and Miriam Phelps. Wells Henry Holcombe died after 1910. William R. Best was born on 16 April 1836. He married Helen Augusta Holcombe, daughter of Elihu Holcombe and Miriam Phelps. Martha J. Keney was born on 2 August 1847 at Bloomfield, Hartford Co., CT. She was the daughter of Osmyn Keney and Elizabeth Julia Huntley. Martha J. Keney married Albert Elihu Holcombe, son of Elihu Holcombe and Miriam Phelps, on 2 March 1869. Clara Holcombe was born circa September 1869 at CT.1 She was the daughter of Albert Elihu Holcombe and Martha J. Keney. Clara Holcombe died.